For the second year in a row, I attended the Ottawa Triathlon Club's coaching clinic. And for the second year in a row, it blew my socks off with how awesome it was. 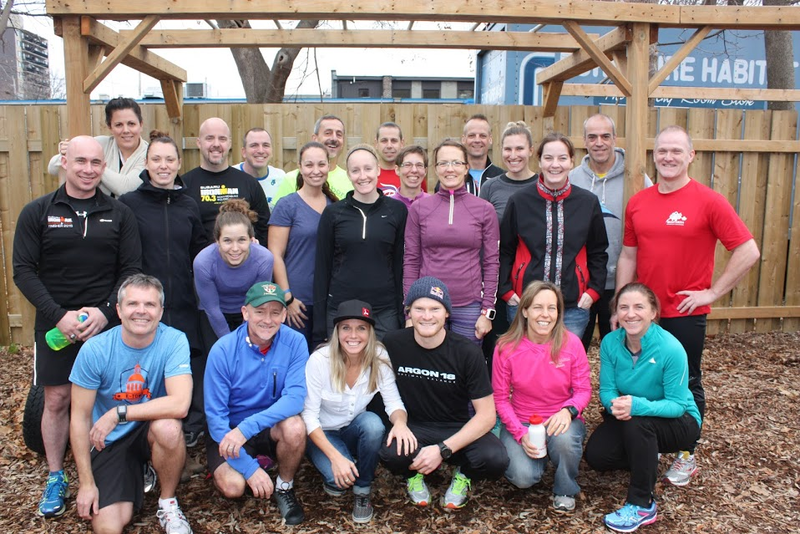 This year our special guest was Canadian rockstar triathlete, Magali Tisseyre. Magali has won 21 half iron distance events (most recently at Los Cabos 70.3) and placed 4th at this years 70.3 World Championship. Magali is so down to earth, fun, charming, and it is easy to tell how much she loves triathlon. She has also gone through lots of ups and downs, and this has certainly given her good perspective on the importance of balance and finding happiness through the sport. We were extra lucky because she brought along her boyfriend, Eric Lagerstrom, a speedy ITU triathlete and the 2015 winner of Escape from Alcatraz. (Eric makes super cool videos of his races and has a web series called Viking Life.) Both Magali and Eric shared tons of useful insights on their experiences in the sport. The weekend started out a the pool with some warm-up exercises, drills, and sighting practice. Then a big group of us went out for breakfast before reconvening at OTC headquarters to continue to discuss swimming. Kim and I gave a presentation on "life in the fast lane." We described some of the differences between our former lives as competitive swimmers and the swimming lives of triathletes. We talked about some tips for improving technique and improving the race day experience. I can do a bit of a recap in a later blog post, but here is another post on swim tips. Magali gave us a great presentation on overcoming adversity. She focused on the idea of finding balance and enjoying the process, rather than focusing so much on the end results. The results will come if you are doing your best at every moment, not only of the race, but in training as well. If you are doing your best, you will have the confidence that you need to succeed. 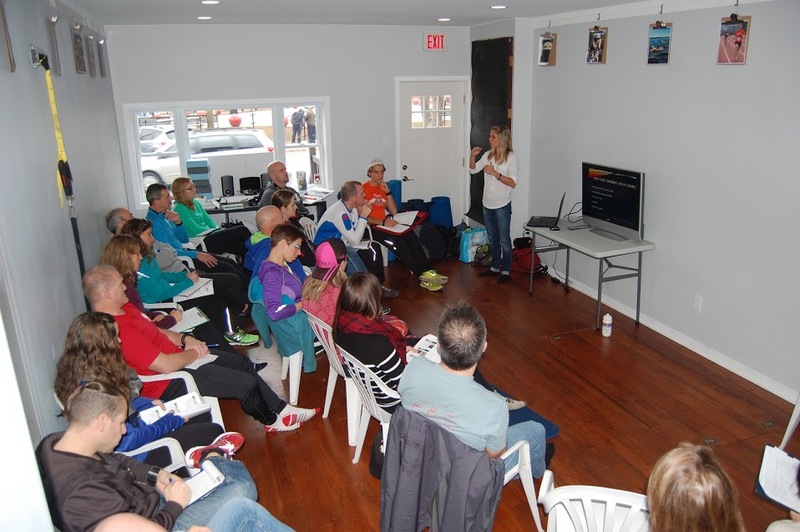 She also talked about having a specific plan with specific tasks to complete on race day. If you can execute those tasks, then you do not have to worry about what will happen in the end. Having balance, by making sure you're having fun and not always trying to go hard all the time, brings perspective that helps you to overcome obstacles. It was great to hear her perspectives on this topic, especially after being injured all summer. After lunch, we talked about different coaching styles and how athletes respond. I'm very excited that I will be co-coaching the High Performance Squad with Coach Dave this upcoming season. We have an amazing group of athletes and I'm excited to be working with Dave to inspire and motivate them on Wednesday nights. For the final session of the day, we went outside to practice running drills and learn a dynamic run warmup. It was freezing, but a lot of fun! 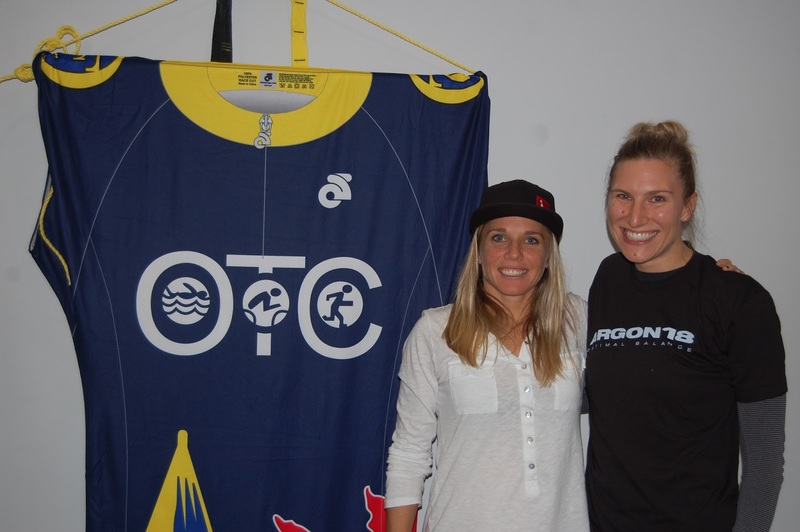 Saturday evening, Magali gave an interview at the OTC Anniversary Party. It had been a long day, and I'm still recovering from some sort of virus, so I skipped the party and went home to rest. On day two, we started out with a discussion of using heart rate in our training, then hopped on the spin bikes for a threshold test. Since I wasn't feeling great, I decided to forgo the test (plus I have a power test on Wednesday morning!). The group totally crushed the test though! 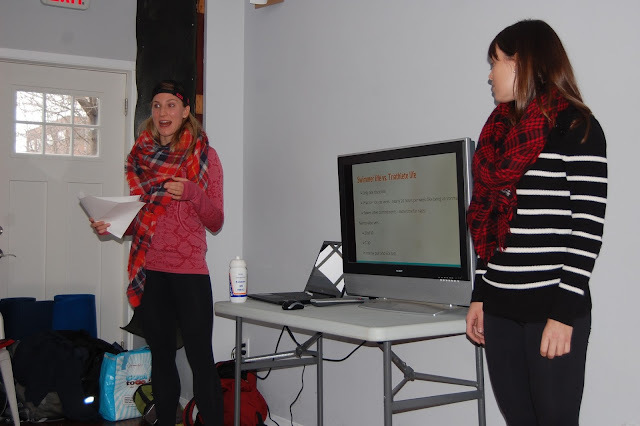 After the test, Geordie gave a presentation on creating a training plan. He went over different theories of periodization and emphasized that a one-sized fits all approach doesn't necessarily translate to the best gains for athletes. After lunch, Dave and Steve gave a very comprehensive, informative talk on the 70.3 distance. Magali provided lots of insight on her vast experience and successes as a half iron distance specialist. And Eric gave some insight into the similarities and differences in the training he does for the Olympic distance. The talk had me very excited about the possibility of doing a half next season! We finished the day learning some strength and mobility moves from Magali and Eric! Then took some group photos before we said our goodbyes. It was a fantastic weekend, full of learning and friendship. I left inspired and excited for the 2016 season! Photo credits to Erik and Derek! Awesome camp!!! That is so awesome that you did a swim presentation!! Great guest speakers too!! Can't wait to see what you decide for next year! !